We still have 142 days to go! Have we had enough yet? Hmm. At times we have had enough of each other and making hostel beds, finding the next place to wash laundry, buy food and reliable wifi. At times we have wanted to go home but we have flights, accommodation and other bookings that keep us travelling and more importantly wonderful places to go, things to do and people to see and the determination to finish our year of adventure. Yes, it is a challenge but we are up to it. Harris has had some recent homesickness and longs for school and friends. It’s hard to explain to a 9 ½ year old that one year will be over before we know it and this time next year he will be whinging about school and we will all be ready for another holiday from work, school and our regular daily lives. And so we carry on with our adventure and roll with the punches and take the good with the bad knowing that we will be home to our own kitchen and washing machine soon enough. Carry on travelling! 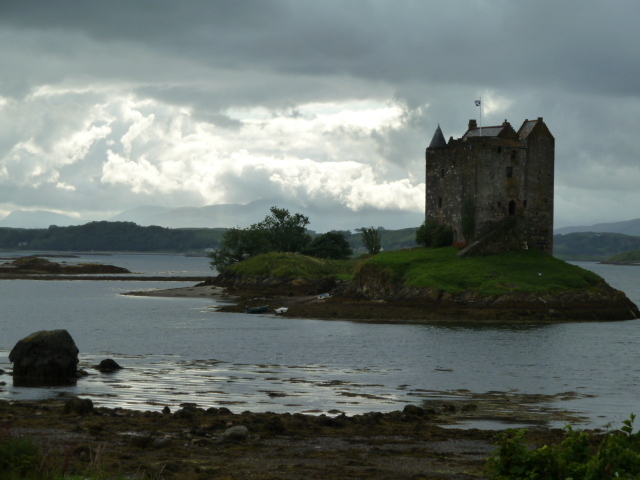 Castle Stalker in Scotland, one of the most famous and most photographed castles in Scotland. Seeing amazing sights like this makes it all worthwhile. Hit there to you all. Hang in there Harris, tomorrow is another day and you will be glad that you are having an adventure. You are one of the luckiest boys in the world having parents who are able to give you this experience. We look forward to hearing about your adventures. By the way, how about an update on new foods that you have tried. Have you had haggis yet? Take care. lots of love Nanny and Grandad.